January 2019 had not only four, but five Wednesdays – lucky us! We used the additional evening for a very special meeting. Our member Daiany invited us to the premises of her employer, the logistics giant Kühne + Nagel in the Hafencity. 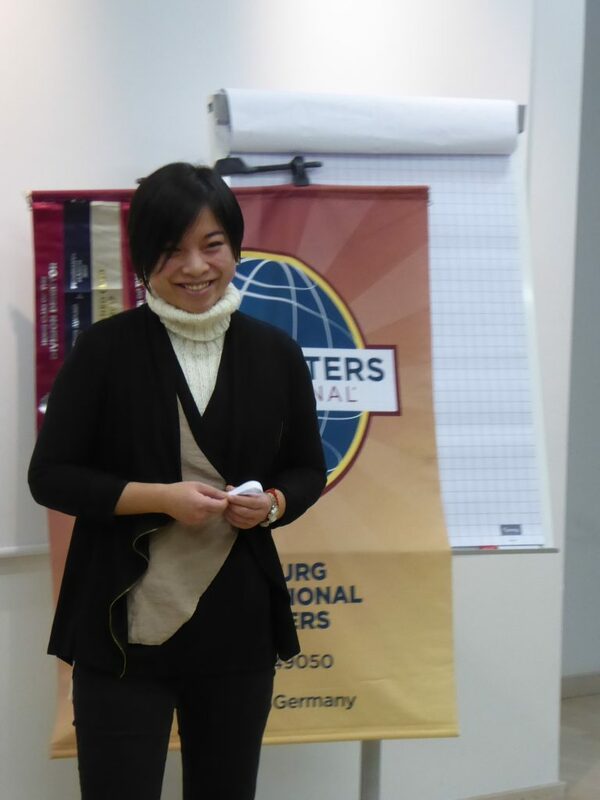 „I told my colleagues so many times about my Toastmasters Club. 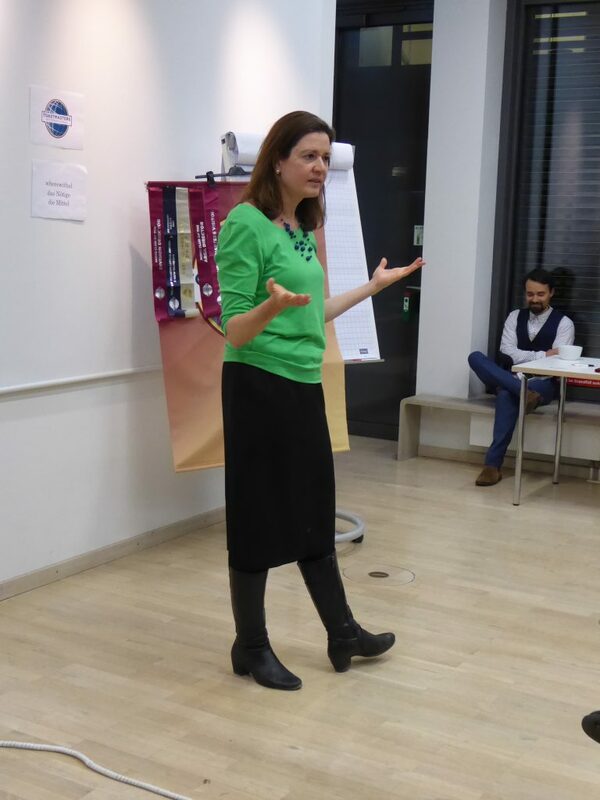 Now I wanted to show them how a meeting like this works.“ An excellent opportunity for the Hamburg International Speakers to introduce themselves and recruit new members. Daiany organized the meeting very well. All participants were greeted with cake and drinks. Also, the room in the modern office building was perfectly set up and had just the right size for such a meeting. 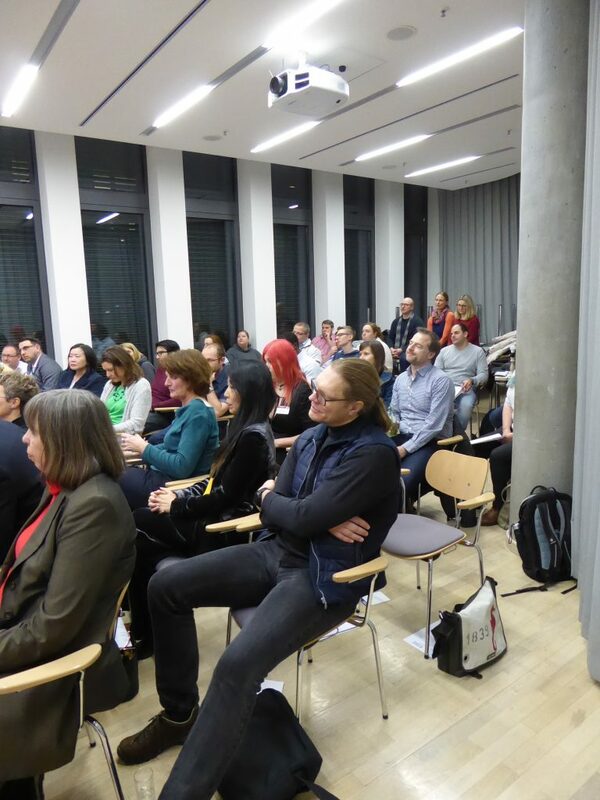 About 30 Kühne + Nagel employees and 20 Hamburg International Speakers came together. Tired after a long working day? No worries! Sibylle made it clear in her welcome speech: this is actually a business meeting, but contrary to all assumptions and statistics, it doesn’t have to be boring and dry! At the latest after all participants had answered the initial question, who or what makes them happy – either in German or English – it was clear: We want to enjoy an entertaining evening together! Prepared Speeches: Touching and Inspiring! The members of the team who organized the evening worked hand in hand. Olaf explained why the evaluation part of the Toastmasters evenings is so important and what the applause is all about. Both prepared speeches were very emotional. Dorothee touched us by putting us in the position of theatre director Kirill Serebrennikov, who has been under house detention in Russia for one and a half years. And Kunle inspired us with his story of the three different kinds of „no“ that shaped his childhood and youth. In the second part of the evening, Julian led us through the impromptu speeches. It’s a pity that none of the guests took the opportunity to stand on stage for a minute or two. Because actually it is not that difficult: after the second speech at the latest it was clear that it is not about answering the question on the piece of paper. With a little creativity you can talk about any topic, and so the question of whether a hot dog is a sandwich becomes a speech about the beloved four-legged friend. A successful evaluation part rounded the meeting off. 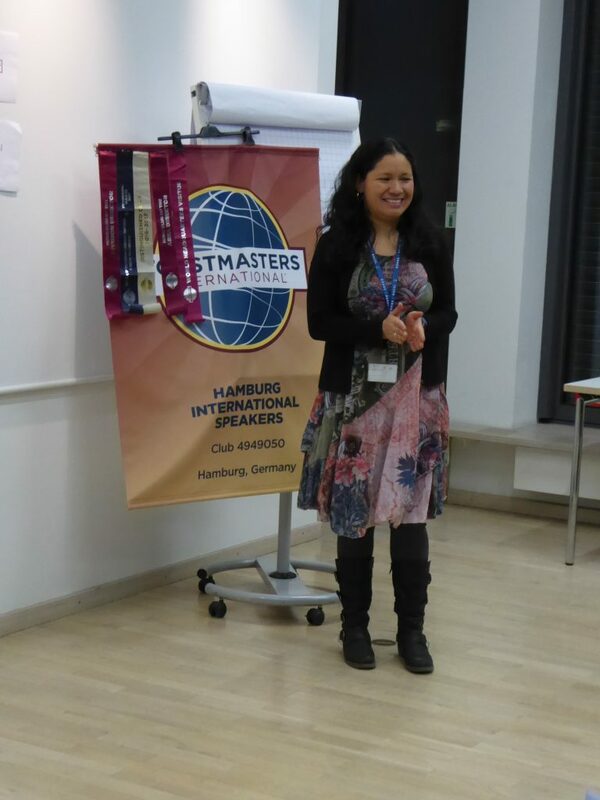 A happy Toastmaster Daiany said goodbye to us, and we were also very satisfied with the course of the evening. Now we are very curious whether we will be able to welcome one or the other of Daiany’s colleagues at our meetings soon. 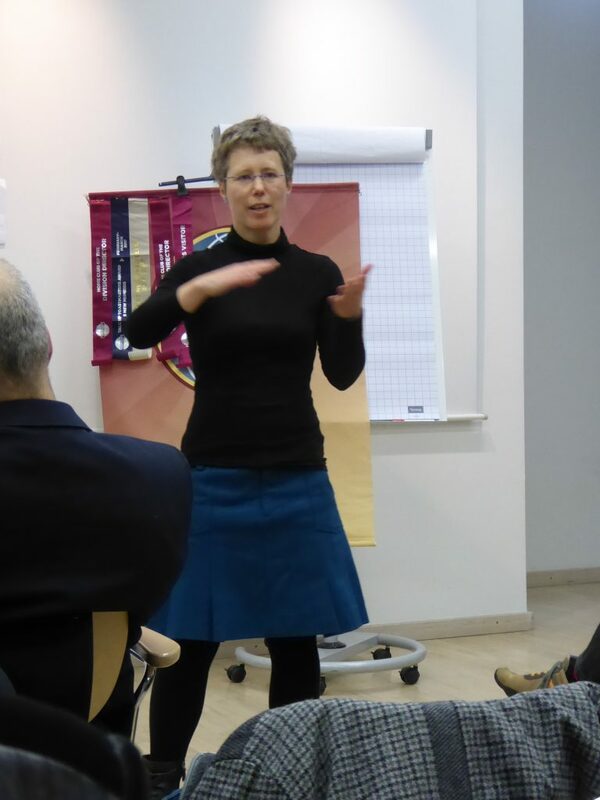 Or whether the Kühne + Nagel staff might even charter a corporate Toastmasters Club! This entry was tagged Hamburg International Speakers, Hamburg International Speakers Club Treffen Deutsch English Espagnol Rhetorik, Reden, Rhetorik. Bookmark the permalink. ← Wie die Zeit vergeht – 3 Jahre Hamburg International Speakers!